During 6 of the reindeer husbandry's 8 seasons we accept families with children, mini-companions or You who are looking for romance, for a genuine and/or a natural mountain holiday. You live in single cottage, double cottage or family cottage with outhouse toilet in another building and simple shower. But in return one of Ammarnäs best views. 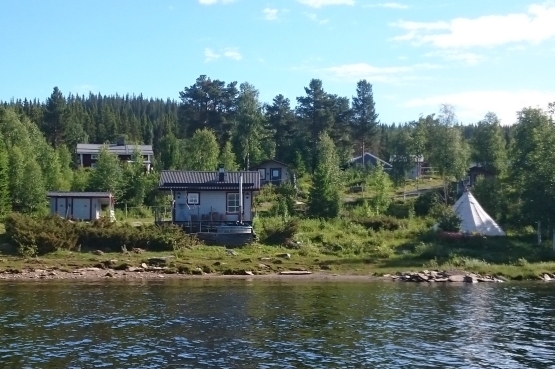 The cottages are scenic on a small hill above Nolavan with panoramic views over Vindelfjällen and Ammarnäs meadows with its picturesque barns. Down by the lake there is a barbecue area with good cooking facilities, and for rainy days there is a barbecue tent (lappish tent) where you can have a cozy moment. Several different pans, pots and a small kithenware are available. Simpler outdoor kitchen with cooking facilities by the sauna. (the kitchen is only open during the snowfree period (May-Oct). During your stay you can "free" spend time in our wood-heated sauna, relax on the sun-deck and take a dip at the farm's "private" beach. At the farm there is a small beach, which you have free access to, where the water for hot summers can be over 20 °C, but the normal temperature in the summer months is between 15-22 °C. But a little cooler dip also feels quite nice after a sauna or after a hot tub. You can also buy a hot bath in a wood-heated tub. The management of the sauna manages the guests themselves. (fill up water, heat it, cleaning etc). The hot tub has 3 price ranges depending on whether you want to buy full, half or no service on the hot tub. Book horseback riding on icelandic horses at the same time, and you will receive 100 SEK in discount / person. Applies to half and full day trips. There are some old (adult) bikes that you can borrow and make a bike trip, maybe a pick-nick in the green feels like a good idea. 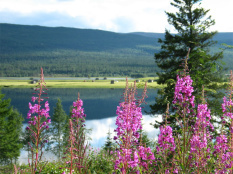 Come and enjoy the lappish countryside and get close to nature on Hedebo Farm! 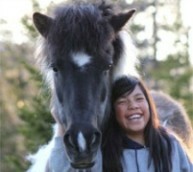 * For those who rent 3 nights or more; 100 SEK in discount / person on (1) islandic horse trip (half or hole day tour). * Outdoor kitchen with kitchen-ware. * 1.500 SEK: Full service on the hot tub. You are bathing / enjoying and we fix everything. * 1.000 kr: Half service on the hot tub. You fill water and heat it up, we clean out. * 500 kr: No service on the hot tub. You fill water, heat up and clean out. * 150 SEK/person Please don´t forget to book in advance. * Information Single cottage "Ribovardo"
* Cushion and blanket available. * Information Double / pair cottage "Lill-Aigert"
* Information Triple / Family cottage "Äivesåive"
* Best suited for max 3 adults or 2 adults + 1-2 children NOTE! booked to double cabin "Lill-Aigert" at no additional cost. others persons are max 2 adults & 2 children (max 12 years). * Maximum number of persons according to above info can book as sharing the same cabin / bedroom. * Adult person taking responsibility for heating and cleaning of sauna and cottage etc.